For people searching for the best ingredients skin-care manufacturers have to offer, peptides are at the top of the list. The skin contains natural peptides, which contribute to the structural strength of the skin and keep it plump and firm. But peptides used in skin care are lab-created. These strands of amino acids penetrate the skin to address common skin-care concerns, including wrinkles, from the inside out. Because of their effectiveness, peptides and the products containing them tend to be expensive. Pentapeptides are made of five peptide units linked together. Some examples of specific pentapeptides found in skin care include Palmitoyl Pentapeptide, also called Matrixyl, and Myristoyl Pentapeptide. They work by stimulating the production of collagen and hyaluronic acid, two natural components of skin that people lose as they age. Because collagen and hyaluronic acid work to support the skin structure, their loss results in wrinkles and sagging skin. Using pentapeptides is one way to counteract and stop this damage, Philosophy and Strivectin are two companies that include pentapeptides in their skin-care lines. Oligopeptides found in skin-care products are similar to pentapeptides, but instead of five units, they contain six, seven or more. Sometimes these are referred to by their specific names -- heptapentides for those with seven peptide units, for example. Oligopeptides, such as pentapeptides, stimulate collagen and hyaluronic acid production. Palmitoyl oligopeptide is one common type of oligopeptuide, used in skin-care lines such as those by Arbonne and Strivectin. Copper peptides hook up with molecules of copper to carry out their activity. The combination of peptide and copper molecules make their way into the deep layers of the skin. Here, they stimulate collagen growth and promote skin healing. Because they latch onto copper molecules and drag those molecules through multiple skin layers, copper peptides tend to be extremely small molecules. Derma Pro and Serious Skin Care are two companies producing creams with copper peptides. Neuropeptides act by affecting neurotransmitters in the skin. When this happens, nerve cells in the skin cease communicating and relax. The overall effect is that skin becomes smoother and wrinkles disappear. Acetyl Hexapeptide, also known by the trade name Argireline, is a six-peptide neuropeptide. 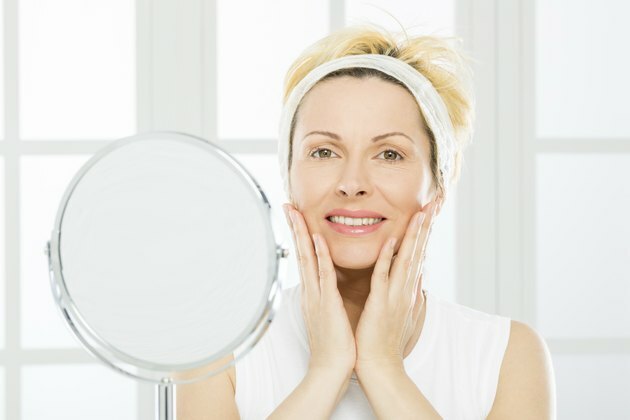 What are the Top Anti-Aging Peptides? Are Eggs Good for Your Skin?